It's been a while since we gave centre stage to our remarkable reptiles, so in May we'll be sketching different species including a Green Iguana named Deano (who is 2m in length and enjoys a head scratch), a Bosc Monitor Lizard named Roxy (likes to fall asleep on drawing boards) and Bearded and Water Dragons, as well as Tortoises and Geckos. All these animals are absolutely magnificent, with unbelievable textures and colours to inspire your artworks. 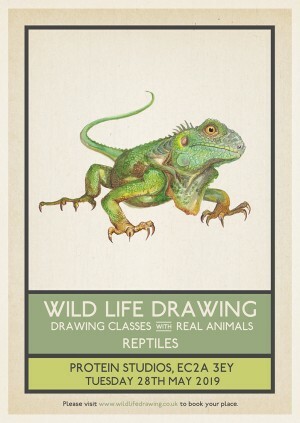 And being cold-blooded, they don't expend any unnecessary energy, making them excellent drawing subjects! As well as sketching these reptiles, we will also be learning about their natural habitats, eating habits and their lives in the wild from the expert knowledge of the animal handlers. We will also be discussing the complex care these reptiles need, responsible pet ownership, the dangers of the trade in exotic pets and any conservation issues affecting these species around the world. The drawing class is open to all, from beginners to advanced. All drawing materials are supplied, including paper, but please feel free to bring colours or any other specific media you might like to use. The aim is to inspire a sense of appreciation and understanding for the animals and their conservation in the wider world. Wild Life Drawing is working with the finest animal handlers, sanctuaries, charities and organisations to put on these events. All the animals that attend the sessions are well used to humans and different environments and are always accompanied by experienced handlers, their welfare is our highest priority. All these reptiles are unwanted pets that have been re-homed by the specialised reptile sanctuary. Money from ticket sales will go towards rescuing and rehoming more reptiles in need.